If you have ever wondered where you, your team, and your work fits into the larger picture at your company, you have come to the right place. Benefits realization management (BRM) is a project management methodology that measures how projects and programs add value to the company and contribute to high-level business objectives. BRM maximizes the ROI from change, and according to Project Management Institute, it is the third largest driver of project success. Learn the three stages involved in executing BRM successfully, and find out how you can build a benefits realization plan for your company using our free templates. Identify the value you expect to get out of a specific project or initiative before you start. During this stage, you’ll determine whether your project is attainable and what results it can produce. Stakeholders must ensure that all benefits are aligned with the organization's strategic goals and vision. 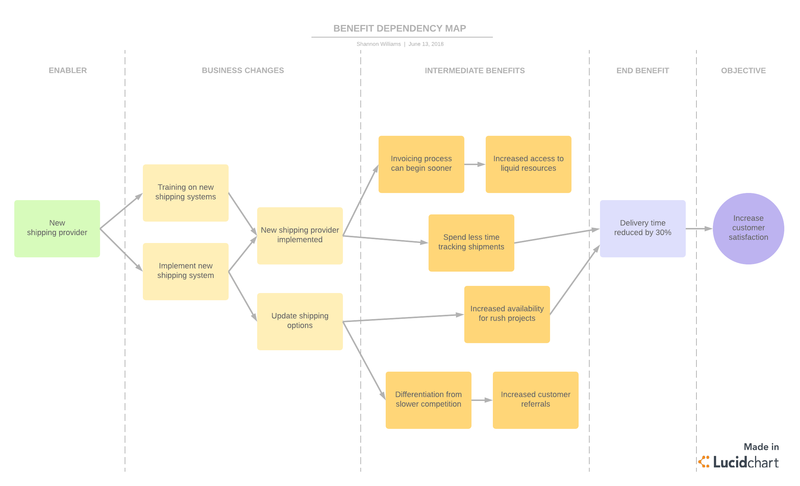 To more clearly demonstrate how your project aligns with company objectives and to get buy-in from stakeholders, you can map your work and the projected benefits to corporate objectives using the Lucidchart templates found later in this article. Some project managers choose to turn this information into a timeline or a benefits realization roadmap to outline when stakeholders can expect the team to achieve benefits. During this phase, work on the project starts, and progress is monitored carefully, ensuring that each team delivers the expected benefits. By monitoring the project from the get-go, you will keep the initiative in line with the company’s strategic objectives. As you go, follow your communications plan and report progress to key stakeholders. This part of the process actually occurs post-implementation. Deliver the project deliverables to the business, and take time to evaluate how the project went. Talk about wins, failures, and “what could be improved” with everyone involved in the project. As you glean more insight into how you can improve, you’ll be in a great place to continually improve performance. At Lucidchart, we believe that working visually can simplify processes and promote clear communication—and that’s certainly the case for BRM. Select a template that best fits your needs, and start connecting your projects back to business objectives. 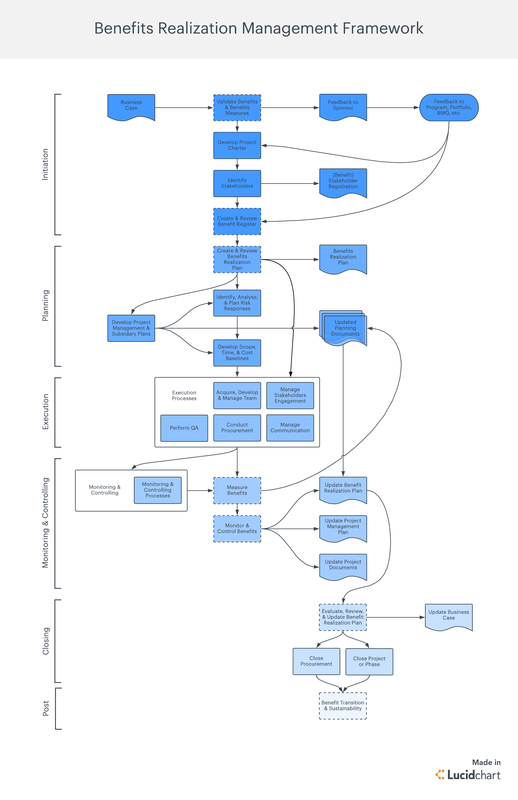 Note: Unlike most flowcharts, you’ll generally complete these templates from right to left. Start with the outcomes you would like to achieve and move toward the tasks required to reach these outcomes. The first three sections define why you are making changes, the next section explains what you intend to change, and the last two sections explain how you intend to get there. To get started with your own BDN, click the template below. Benefits realization management is a unique and concrete way to align strategic goals with project lifecycles. 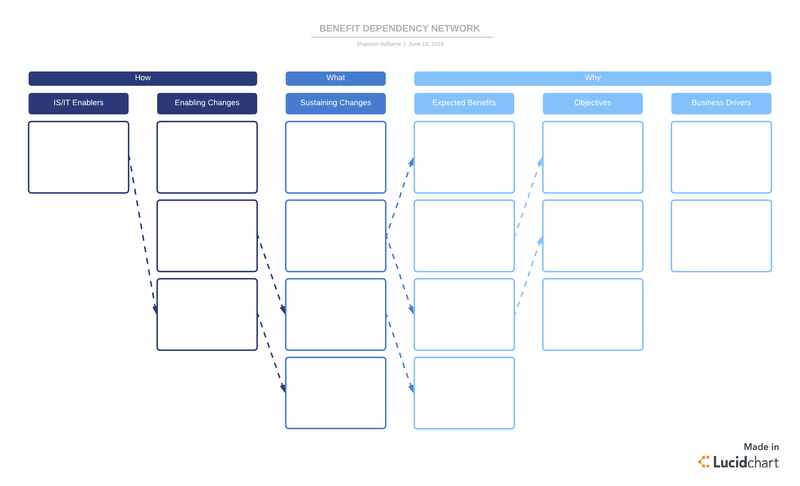 Any organization that chooses to adopt the benefits realization process will easily yield its benefits (now we’re getting meta). 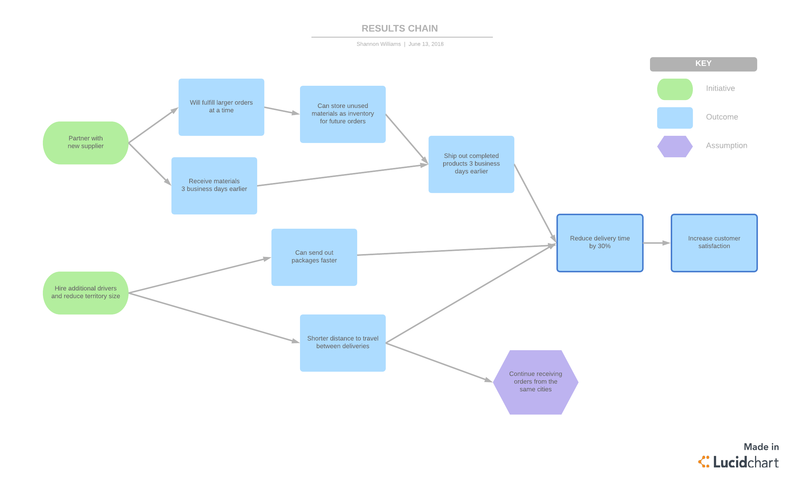 Use Lucidchart to start implementing benefits realization management. With your free account, you can access any of our templates or easily drag and drop shapes to map out your plan. Sign up today.